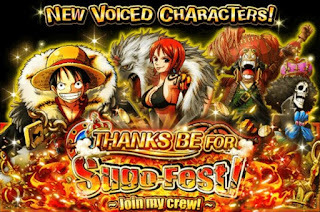 OPTC Guideblog: Log Luffy Sugofest! This Sugofest will feature a Rate-Up on ALL PSY Units currently available. In fact, any you'll pull will be obtained at Level 20!! Meaning you won't have to waste that many turtles!! This will ALSO work alongside the Rate Up sugofest units mentioned below thus, PSY Units among them will have a high chance of being pulled this time. Finally, we just want to wish you all the best of luck with pulling these units (if you decide to pull). And as usual, good luck and have fun! Log Luffy VERSUS the rest! !